Work at the Hogan/Belcourt House on river lot 24 in St. Albert has progressed throughout the summer of 2018 and here is an update of some of the work that has been completed. Once the removal of the rotten material was completed, and the building was stripped down to its structural components, it was time to start the reconstruction using, as much as possible, the original construction materials. Pictures #1, #2 and #3 (below) show the sequence of the work, which is the same for each of the walls. Picture # 1 is the as found condition of the west wall and kitchen. 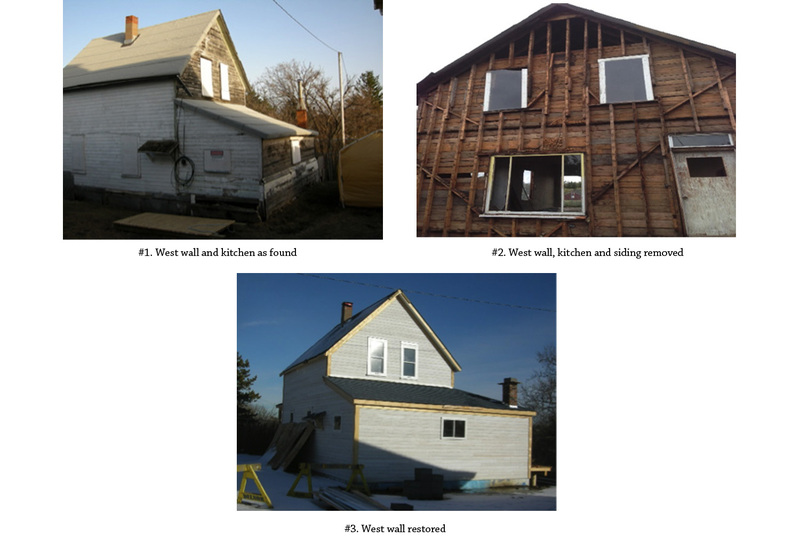 The second picture shows the west wall with siding and kitchen removed to expose the original structural elements of the wall. Picture #3 shows the finished restoration of the west wall. Although each wall is different and each structure has its own conservation pathway, the end product should be an accurate representation of the original structure. When rotten wood needs to be replaced we attempt to replace it with compatible wood. Size and dimension of original wooden members are generally different than today’s lumber dimensions. In the “old days” a 2 X 4 was actually a piece of wood that was cut 2” X 4” whereas today a 2 X 4 is only 1 ½” by 3 ½”, which requires us to modify structures or special order lumber with the correct dimensions. Once the exterior walls have been secured and are weather tight then generally the exterior roof of the building is repaired to ensure protection for the entire structure. Old shingles are removed, rotten sub roofing is replaced. Most old houses have sub roofs that are constructed of 1 X 6 shiplap. This lumber type and dimension is not readily available any more so again we have to replicate the boards by cutting rabbets along the edges of 1 X 6 planking to create replacement boards that will interlock with the original shiplap. We then replace the tar paper layer (if there was one) and re shingle the roof using cedar shingles, if that was the original roofing material.